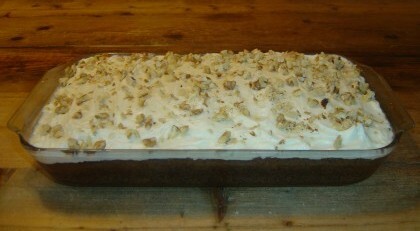 Both of my children love carrot cake, and both have recently had birthdays and carrot cakes. I tagged this post with “vegan” because the first cake I’m going to talk about is vegan, but the second (which includes the recipe) is not. Arthur turned 19 just over a month ago, but as he’s off in college in another state I was not exactly able to make him a birthday cake this year. 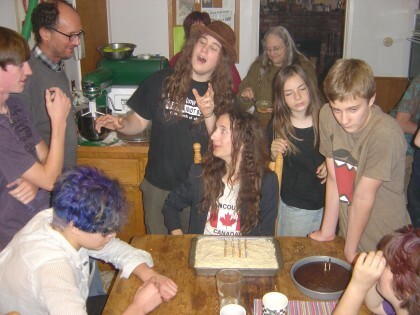 And actually, I had also helped Arthur make the same cake for his 16th birthday, but as a sheet cake rather than a layer cake. Whether as layer cake or sheet cake, this is a really outstanding cake, well-worthy of the author’s “if I were to make a commercial” recipe introduction, where when “the mom” brings the cake out, suddenly a calypso band appears and everyone is dancing. Even people who are suspicious of vegan cakes will have absolutely no complaint with this one (that is, if they like carrot cake :-)). I will also note that both times Arthur chose to substitute walnuts for the macadamia nuts, and that with the August cake I used the leftover coconut milk (the frosting uses ¼ cup of coconut milk, so you still have most of a can on hand) in multiple stir-fry curry-noodle dishes during the following two weeks. I’m not going to include the recipe here because Vegan with a Vengeance is a current cookbook — go buy a copy or get it from the library, and you’ll be happy to have so many great vegan recipes and be supporting the author. Oh, and you can find many vegan recipes on her Post Punk Kitchen web site, despite this cake not being one of them. And I’m going to see Isa Chandra Moskowitz next month at Bookshop Santa Cruz, YAY!!! And Sam turned 25 just exactly a month ago! 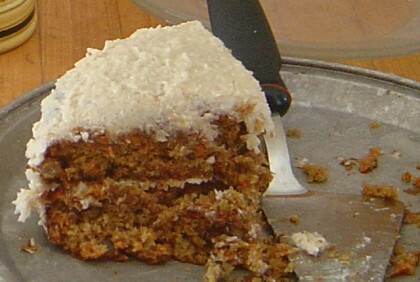 It’s not that he specifically requested a non-vegan cake; rather that even though he enjoyed Arthur’s cake, he’s not really a coconut fan, so he wanted a carrot cake without coconut, and I decided to make one I used to make back in the ’70’s. You can see the results below, next to a platter of his birthday cookies (which I will describe in another post). Sam’s carrot cake’s recipe came from a 1970’s issue of Gourmet Magazine (my mom was a subscriber), and for this one I will include the recipe below. First, as far as I know it’s not in any cookbooks — when I was doing a search for “Gourmet Magazine” and “carrot cake”, what I was finding was a lot of talk about a recipe they ran in 1990 featuring pineapple and raisins in addition to the carrots, and that recipe is definitely not this recipe. Second, the version of the recipe I have is not a clipping from the magazine, but rather a list of ingredients (including things like “2 tsp cinn, pow, soda”) I had written down on the inside back cover of The Rolling Stone Illustrated History of Rock & Roll (what can I say, that was what I was doing with my recipes at the time), and as I didn’t include any instructions other than baking temperature/time, I’m not sure whether I had made any changes to the recipe (other than leaving out potentially-helpful information such as the size of pan to use :-)). This really is a very classic carrot cake — try it and you’ll like it, carrot cake fans! Take the cream cheese and butter out of the refrigerator, and set them aside to soften at room temperature. Cream together the eggs, sugar, oil, cinnamon, and salt, in a large mixer bowl or other large bowl. Add the flour, baking powder, and baking soda to the bowl, and thoroughly mix them in. Grate three cups of coarsely-grated carrots (you can put any extra on a salad or pasta dish, or just eat it). Add the grated carrots and the pecans and/or walnuts to the bowl, and thoroughly mix those in as well. 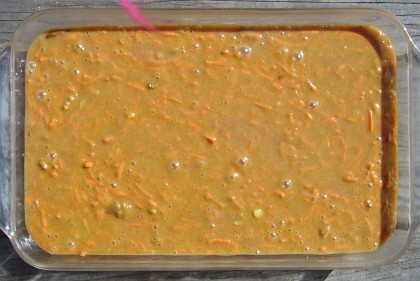 Pour and spread the batter evenly into an 8″ by 12″ pan (just look at that nice 1970’s earth- tones color palette of cinnamon-brown batter with bright-orange grated carrots! ), and bake it in a preheated 350° oven, setting the timer for 30 minutes, and then checking it every few minutes until it tests done. Because I had neglected to write down pan info in the book, I was unsure what size to use. When I poured the batter into my 8″ by 12″ pan I was concerned that it might rise so high that it would start dripping over the edges of the pan, but as you see here it rose nice and high in the oven without overflowing. A 9″ by 13″ pan, or two 9″ round or square pans, should work fine as well. Because you need to wait for the cake to completely cool before frosting it (so the frosting doesn’t melt) you may want to wait a bit before getting started on the (quick, easy) frosting. Put the cream cheese, butter, and vanilla in a large mixer bowl or other large bowl, and mix them together a bit. Add the powdered sugar about a quarter of it at a time, and mix it in slowly and carefully so it doesn’t fly out all over the counter and your shirt. 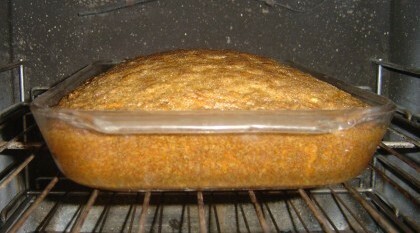 This amount of frosting will frost the top, sides, and filling of a layer cake, so if you’re only doing the top of a sheet cake as shown here, unless you just love having as thick a layer of frosting as possible, you will probably want to put some of the frosting in the refrigerator to use with cookies or cupcakes later. If you’re a big fan of nuts, then sprinkle even more coarsely-chopped pecans and/or walnuts on top of the frosting as shown above. As one of my sacred baking rules is “Always Double The Spices, Chocolate Chips, And/Or Nuts”, yes, when baking the cake, and when transcribing the recipe for this post, I doubled the amounts of cinnamon and nuts that I had written down in the book. Also, the ingredient list I had written in the book did not include any salt, which was suspicious to me when looking back from the vantage point of 2013, especially with a cake that contains oil instead of salted butter. I went ahead and included a teaspoon of salt anyway, under the theory that the original recipe probably did contain salt, and that I had probably left it out because at the time I also happened to be on a quest for the perfect chocolate-chip cookie recipe, and had been experimenting with the effects of variables like leaving out the salt.